Hint: Mom would love to put up her feet up and relax next to a serene water garden. You know who you are, you guys out there who haven’t gotten the all-important Mother’s Day gift yet. You’re probably going to be running around at the last minute, maybe buying some outfit that she’ll return on the Monday after Mother’s Day, or maybe, worse yet, you’ll send flowers. Does anything say “I forgot Mother’s Day” like a flower arrangement? But there is hope. Even with only days to spare, you can pull the Phoenix from the flames and get your wife or Mom something she really wants. So what do Moms really want for Mother’s Day? A place to relax. Motherhood is stressful from start to finish. There’s birth – enough said about that. Then there are the diapers, feedings, baths, science projects and thousands of cupcakes that will need to be baked before the little nippers are even in junior high school. 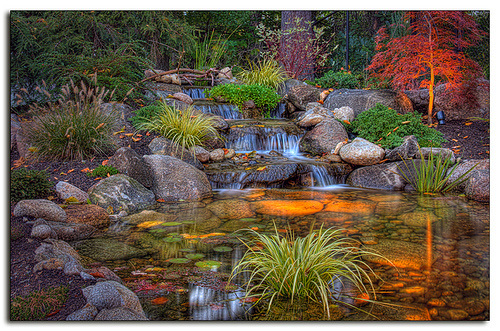 Let’s face it – Mom needs a place to relax and a beautiful water garden from Dana Landscaping is just the ticket. No one can sit and listen to the sound of a waterfall and look out over a beautiful water lily and feel tense. Well, a glass of wine also helps. Something of lasting beauty. Flowers from a florist are nice but they’re gone in a few days and then all that’s left is an ugly vase. But an investment in your property can bring color and beauty that she’ll enjoy for years to come. And with a well-designed outdoor space, she’ll have more room for entertaining or just relaxing. A project that’s fun (but not a lot of work). She may love a beautiful garden, but she may not love all the hard work that goes into it. That’s why we’re here! She just needs to tell us what her vision is, and we’ll go to work making it happen. If she isn’t sure what she wants, we can create a design that is perfect for the space (and your budget). We specialize in transforming under-utilized areas of your property into beautiful outdoor living spaces. SO HERE’S WHAT YOU DO: Find a picture on this web site that you like…a water garden, planted bed, a patio, whatever. Print it out. Place said picture inside of the thoughtful Mother’s Day card you buy at CVS. And then contact us to come out for the free design estimate! Next post: April Showers Bring May Flowers. Then What?